Every time I turned around last week, there was another bride sailing into Central Park trailed by one, two or even three wedding photographers. 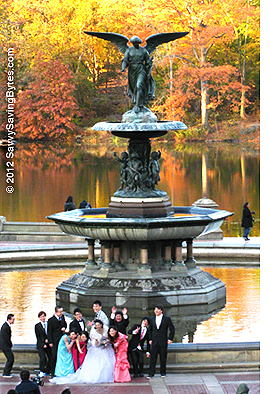 Here, the bridal party poses in front of Bethesda Fountain with its brilliant backdrop of autumn foliage. This practical bride is wearing a warm jacket, unlike all the others I saw who braved cold temps in bare shoulders while park goers were bundled to the ears. Echoing what seems to be a more casual wedding theme these days, all the males in her bridal party sported athletic shoes. 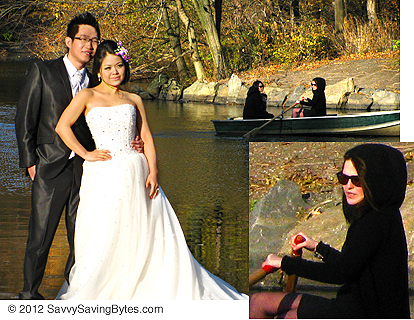 I was taking a shot of this bride and groom (below) when the rowboat behind them caught my eye. Who was that mysterious hooded rower with the large shades? Rather than melting into the background, her distinctive disguise suggested an athletic, elegant monk. Could it be Keira Knightley? She’s in town now. And, unlike Americans, aren’t English females big rowers? 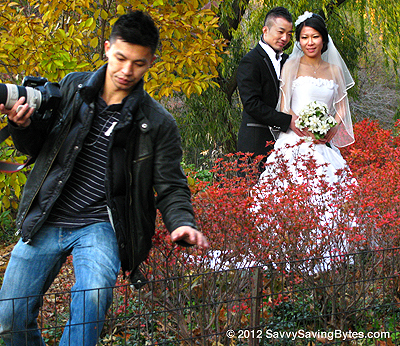 The wedding photographer below is about to leap a fence bordering a path along the Boat House Lake. That fence is there to keep visitors away from lovely plantings along the water. While the conservationist in me understands the need to keep park visitors out of there to protect the plants, the photographer in me hates obstacles standing between my camera and a good shot. Our groom appears to be wearing a scarf instead of a tie, so he scores in both the comfy and spiffy department. Below, the bridal couple heads for yet another scenic spot for more photos. Carting balloons and basket, the groom could be in training for future expeditions to carry home his new wife’s shopping loot. With its beauty and stunning variety of settings, it’s no surprise so many brides select Central Park for their bridal photos. Which leads me to imagine an awful lot of young women must be saying an awful lot of prayers to keep rain clouds away from their upcoming wedding trek through our famous, fabulous park. Does Lack of Love Lurk behind a Big Spender? Nice shots Pat, and what a good eye you have catching that probably famous rower. It does look like her. The fountain in the first photo is my favorite fountain in Central Park. We can’t wait for our NYC trip! That fountain looks so great since the park restoration. It was really a lovely place this Fall. Got lots of shots of some big bubble blowing guys. That’s something you and Martin will have to see.